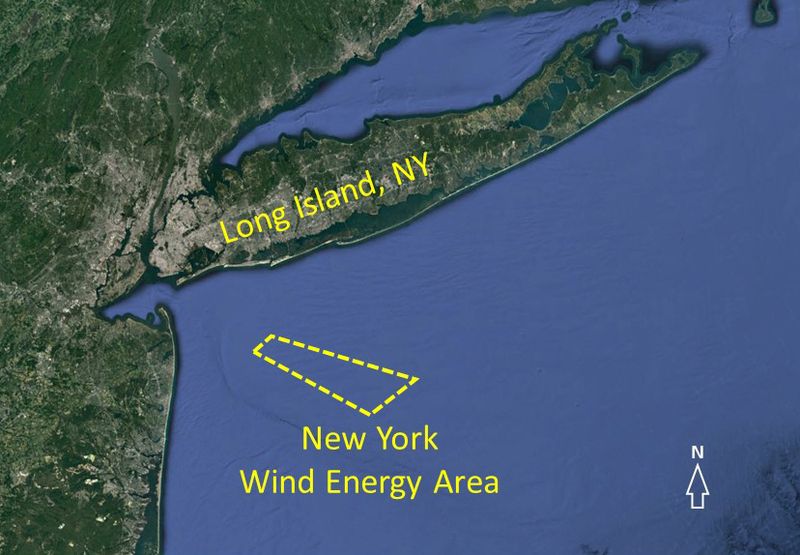 Map of New York Wind Energy Area. The area consists of 79,350 acres and is located south of Long Island, New York, approximately 13 miles off of the Rockaway Peninsula. This year, National Centers for Coastal Ocean Science (NCCOS) scientists aboard NOAA Ship Nancy Foster completed a 10-day acoustic seafloor mapping mission in the New York Wind Energy Area, a proposed offshore wind power site south of Long Island, New York. The team also conducted optical ground-truthing surveys, substrate and grain-size characterization, and hard-bottom predictive modeling of the area. The researchers are using data collected on these missions to produce comprehensive seafloor habitat and substrate maps of the Wind Energy Area, as well as maps of fish distribution and abundance within the site. The surveys satisfy a key part of the three-year agreement signed in 2016 with the Bureau of Ocean Energy Management (BOEM) for NCCOS to produce seafloor maps and model validation of the New York Bight region in support of alternative energy development. Before approving a renewable energy project in the Wind Energy Area, BOEM will use NCCOS’s site characterization to evaluate the potential effects of a proposed facility on the region’s biological, social, physical, and economic resources. The work also furthers the state of New York’s goal of providing 50 percent of its electricity from renewable energy by the year 2030. 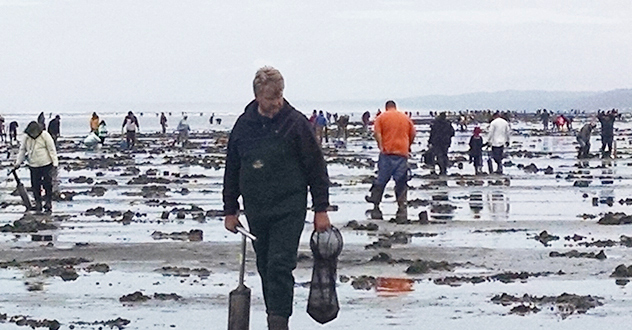 In April 2018, the NOAA-sponsored harmful algal bloom (HAB) forecast for the Pacific Northwest gave the Washington Department of Fish and Wildlife (WDFW) confidence to proceed with the opening of the Washington recreational razor clam fishery. The opening coincided with the occurrence of the Long Beach Razor Clam Festival, an event that has celebrated the fishery since 1940. The WDFW estimates that there were 71,300 digger trips (one digger/one day) during the fishery’s opening weekend, with an estimated revenue of $6.4 million for the region. The HAB forecast is part of a NOAA ecological forecasting initiative that aims to deliver accurate, relevant, timely, and reliable ecological forecasts directly to coastal resource managers and the public. NOAA and its partners also provide HAB forecasts for Lake Erie, the Gulf of Maine, and the Gulf of Mexico; and hypoxia forecasts for the Gulf of Mexico, Chesapeake Bay, and Lake Erie. National Centers for Coastal Ocean Science (NCCOS) helped coastal managers and aquaculture businesses in California, Florida, and New York identify thousands of acres suitable for offshore aquaculture development through siting assessments. Based on analyses of a variety of spatial data, these assessments are facilitating the permitting and development of commercial aquaculture, while minimizing conflict with existing uses of ocean space. NCCOS also released the MARINER AquaMapper, a decision support tool designed specifically for the Department of Energy to perform scalability analyses and identify suitable spaces to grow macroalgae in the U.S. exclusive economic zone. The mapping tool is a key project deliverable for the Department of Energy's $30 million initiative (ARPA-e MARINER) to research the potential of macroalgae as a source of biofuel. 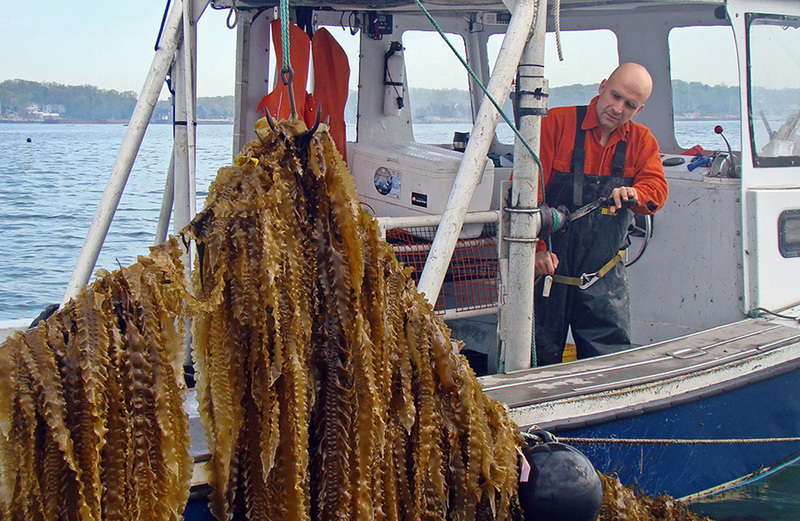 Harvesting sugar kelp (a species of macroalgae) off the coast of Milford, Connecticut. In the U.S., macroalgae are gaining popularity as nutritious food and could potentially serve as a source of biofuel. National Centers for Coastal Ocean Science (NCCOS) developed a biogeographic assessment and a geospatial decision support tool to help inform the proposed boundary expansion of the Flower Garden Banks National Marine Sanctuary (FGBNMS) in the Gulf of Mexico. The team analyzed 14 years of data to produce the assessment, and incorporated 20,000 direct observations of ecologically significant corals in the geospatial tool. The FGBNMS Advisory Council’s Boundary Expansion Working Group, which includes representatives from the commercial and recreational fishing, oil and gas, research, and conservation sectors, used these products to develop recommended boundaries for 14 proposed new management areas. NCCOS also sponsored research that led to the Gulf of Mexico Fishery Management Council’s expansion of the Pulley Ridge Habitat Area of Particular Concern, located roughly 150 miles off of Florida’s southwest coast. The expansion includes a new coral area that has the densest and most extensive area of plate corals known in the Gulf of Mexico. Scientists discovered the new coral area as part of an NCCOS-funded study analyzing the role that mesophotic reefs — reefs that are located 75–270 feet below the water’s surface — play in replenishing commercially important fish species, such as grouper and snapper, in the shallower, downstream reefs of the Florida Keys. 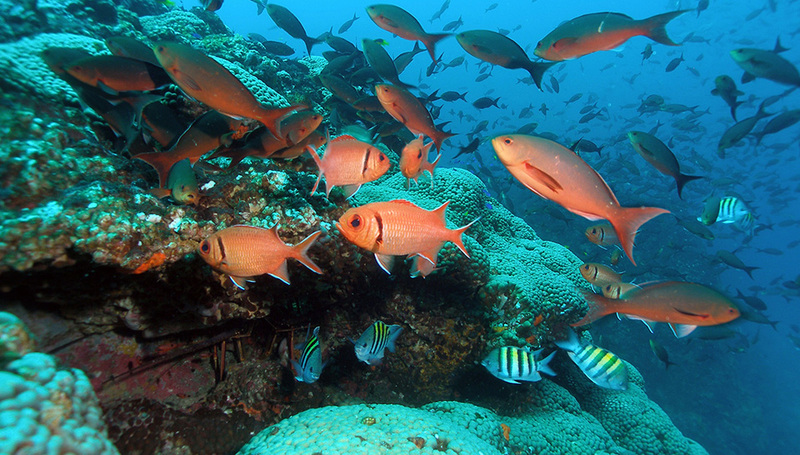 An abundance of sea life inhabits the Flower Garden Banks National Marine Sanctuary. Sea level rise, shoreline erosion, and pond formation threaten salt marsh habitats at the U.S. Marine Corps Base Camp Lejeune in North Carolina. National Centers for Coastal Ocean Science (NCCOS) scientists and staff from the U.S. Army Corps of Engineers are providing the base with data and strategies to address these problems. In spring 2018, the team applied dredged sediments to a marsh pond at the base, then planted marsh grass in the former pond. 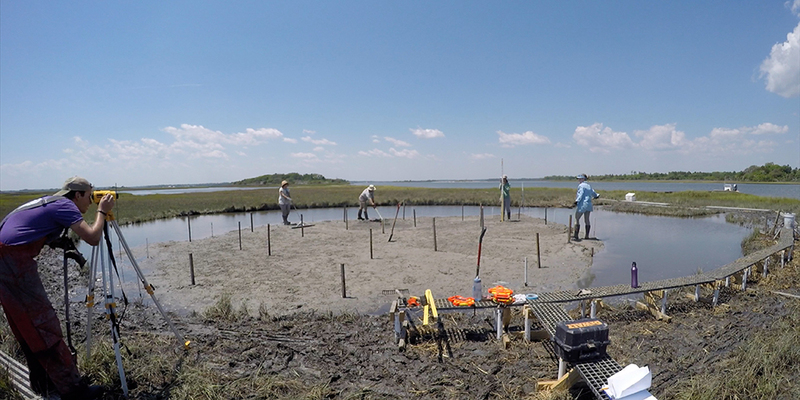 As part of this pilot project, the researchers also collected data on sediment, water quality, planting success, and fish use of the marsh to support development of larger-scale shoreline restoration projects at the base and in other parts of North Carolina. Also this year, NCCOS and The Nature Conservancy released a Living Shorelines application for central coastal North Carolina. Coastal managers and residents can use the map-based tool to identify where conditions are suitable to use a living shoreline as an erosion control strategy. Nature-based living shorelines provide an alternative to “hard” shoreline stabilization methods, such as bulkheads, and provide many benefits including nutrient pollution remediation, essential fish habitat provision, and protection from waves and storms. The team applied dredged sediments to a marsh pond at Marine Corps Base Camp Lejeune, and then planted marsh grass in the former pond. The methods developed for this pilot project could help inform other military installations and coastal communities in need of shoreline restoration.